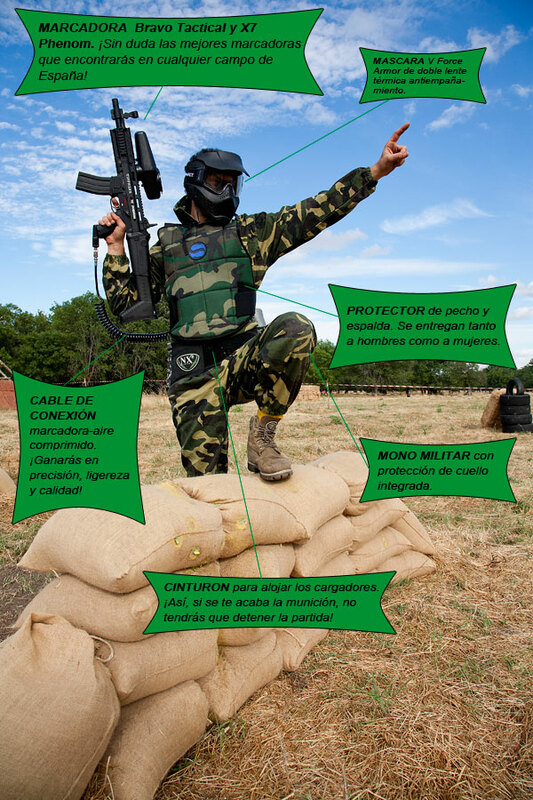 In Gran Paintball Madrid you will play with the equipment that is used in high competition. This is one of the biggest differences between us and other fields. No Paintball field in Madrid has our equipment, by far. MARKER: BRAVO ONE TACTICAL, Tippmann’s new marker that imitates an M16 and X7 PHENOM, with FlexValve technology and manual or electronic shooting mode, and due to its novel design eliminates the recoil to improve accuracy. MASK: V FORCE ARMOR double thermal anti-fog lens. SUITS: Military camouflage suits with integrated neck protection. Each team will wear a suit of a different colour (camouflage grey and camouflage green). VESTS: Protector of chest and back of camouflage of different colors to distinguish each equipment with special fabric not to absorb the sweat. Vests are given to men as well as women, boys and girls. GLOVES: Gloves without fingers to mitigate the friction with the equipment. COMPRESSED AIR CONNECTION TO MARKER: New! Remote connection cable designed not to have to carry the bottle attached to the marker (weighs much more), but directly to the back of the belt, so nothing will diminish your aim! Battle Pack Nxe Belts to hold up to 4 reloads, so if you run out of ammo, you won’t have to stop the game and can recharge in full combat! Compressed Air: At Gran Paintball Madrid we use compressed air instead of CO2. The compressed air, being much more consistent and stable, makes each shot come out at the same pressure. Besides, it is not affected by the temperature, so we gain in efficiency and above all in quality. 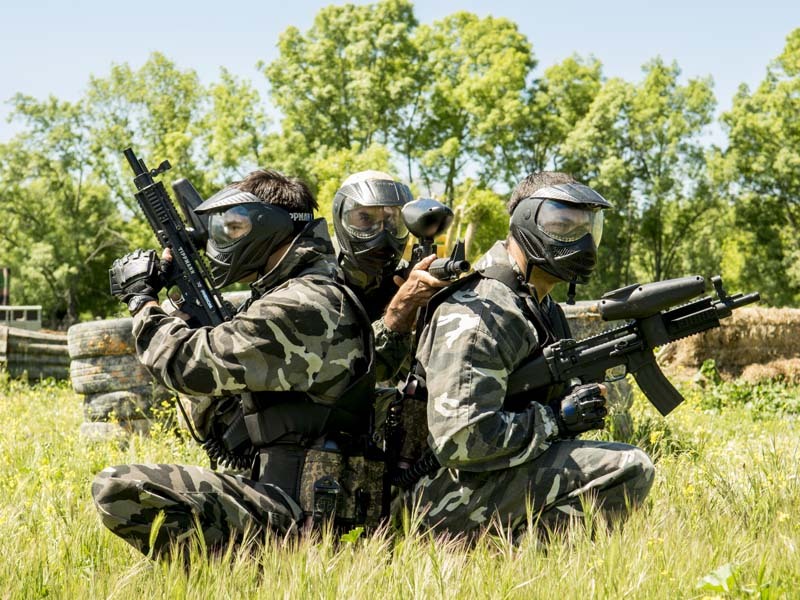 Come to our Paintball fields in Madrid and enjoy the games equipped like a real professional!